As you know, I was up at Creative Academy+ Manchester yesterday filming the CND Garden Muse collection video (click here if you missed it) Well like usual I stood staring at the stands mentally going through my stock. There was only one thing that I needed to replace but I'll get into that later! 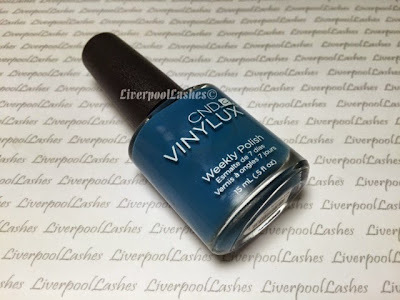 First up I bought CND Vinylux in Blue Rapture. I did manicures for a baby shower on Sunday and as I looked through my collections I realised that I only had dark blues so I picked this up as a brighter alternative. I have to say I'm loving Vinylux right now. I actually didn't get into it until last summer but I've just it quite a bit since then. Next up is the replacement I was referring to earlier, I swear I've thrown my Lecente Stardust Glitter in Neptune in the bin. Yes you can recoil in horror at that thought, just like I do when I think of it but I'm sure it that that's somehow what I've done. Although I now have a replacement tub I'm hoping that I'm mistaken and I end up with two tubs if the first one appears. I had to buy a new one or I would have pined for it! 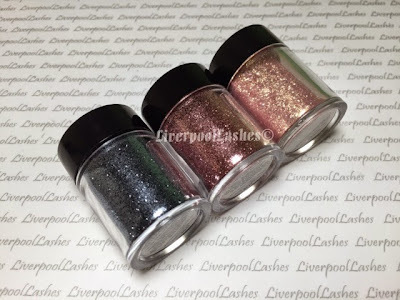 The other two glitters I bought with Blue Gun Metal and New York, just because I fancied them and certainly not because I need any more glitter...! I'm excited to wear them on my own nails actually! I was a big fan of Dashing Diva. Admittedly I wasn't as keen on the full coverage ones as they were more fiddly but gave a good effect. 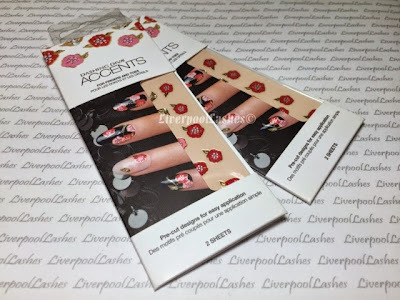 It seems that the collection is being condensed at the Academy so they did have excess stock which was half price so I picked up two packs of their Accents which are my Favourite and fuss-free. Onto the MoYou London plates that I couldn't resist. The academy have just received new plates into their stock which I saw a message about it on Friday so I was excited to be up there the next working day for "for dibs" of them. 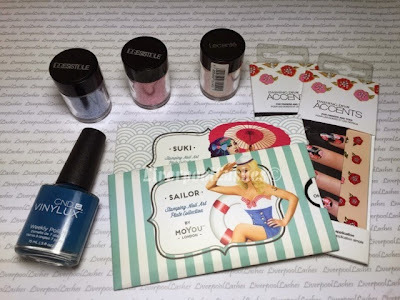 I choose Sailor Collection 06 because I really like the other one I have from that collection and this is an extension of that. 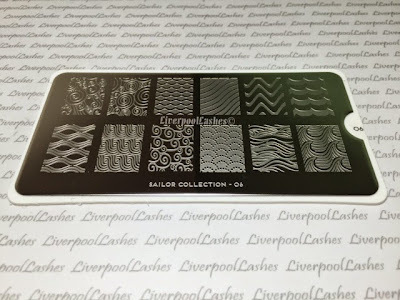 The other plate I purchased was Suki Collection 05 which was just because I find the patterns really interesting. I do prefer full prints rather than random images. I can't imagine there being much call for the geisha looking woman in the bottom left corner but the rest are good. I hope you've enjoyed reading my nail supply haul. Obviously nothing essential, just totally for funsies. Is it crazy that I enjoy putting new fun supplies away in their new homes?! Don't answer that!